Mercy’s Alessandra Fronc blocks April Artis’ path to the basket in Friday’s SCC girls basketball game in Middletown. 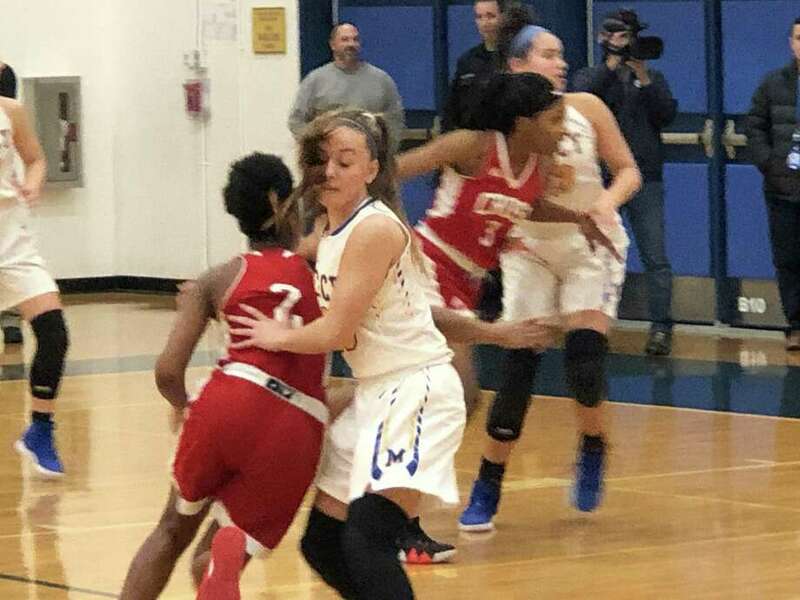 While not at their best Friday night, the defending Class LL champion Tigers used a strong second half at both ends of the floor to win their fifth straight, 53-37 over Wilbur Cross in a SCC interconference game. Senior guard Kameryn King, who was averaging 18 points a game coming in, scored a game-high 21 for the Tigers (7-4). King is averaging 22 points in Mercy’s winning streak. Wilbur Cross (9-3), which started the week just outside the top 10 in the latest GameTimeCT poll, saw their four-game winning streak end. The Governors had won eight of nine coming in, their only loss in that stretch against unbeaten, No. 2-ranked Trumbull. Cross coach Tyrees Thomas, whose team beat Mercy by 13 on Dec. 27, felt the Tigers played at a higher level this time around. Mercy overcame disjointed and sloppy stretches of play on its end in the first half to lead by three at the break, but Cross scored the first five points of the second half to take a 29-27 advantage. The Tigers tied the score on two free throws by King, then summoned a 12-5 run to finish the third quarter. Capping the run was senior guard Sophia Finkelday. She turned a loose ball into an uncontested layup and swished a 3-pointer with 1.4 seconds on the clock to give the Tigers a 41-32 lead heading to the fourth quarter. “Sophia made a couple of great shots there,” Mercy coach Tim Kohs said. Lilly Hedge added 10 points for Mercy. Finkelday scored nine and Rachael Cipolla chipped in eight. King had only a 3-pointer in the first quarter, but she found her shot and a way around the Governors’ box-and-one defense to put up nine points in the second quarter. After being held to eight points in the third, the Governors could not buy a shot in the fourth. Mercy scored the first seven points of the quarter — a drive to the basket by Cipolla, a bucket by Hedge from a nice feed by King after drawing in the defense, and a 3-pointer by King — for a 48-32 lead with 4:52 remaining in the game. Cross missed its first seven shots from the floor in the fourth, as well as two free throws. It wasn’t until Anaija Ricks made two free throws with 4:23 to go that the Governors had broken their drought. Cross made one of only 14 attempts from the field in the fourth and scored just five points. Its only field goal came after Ricks’ free throws, a shot off the glass by Tynisha Thomas with 3:12 left. Senior guard April Artis was the only Cross player in double figures, scoring 10. The Tigers have two SCC games next week, both at home at 7 p.m. — against Daniel Hand on Tuesday and Career Magnet on Thursday.